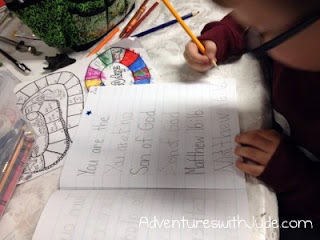 Our Lenten project has been coloring one square each day on our "Road to Calvary" worksheet, and one Bible verse taken from that day's Mass reading. I admit, the week before last was hectic with doctor's appointments, so we missed a few days of lessons. On Saturday afternoon, Jude and I worked on catching up on our coloring and copywork while Neal took the big kids to Church. Our usual practice is to color in the day's stepping stone, and then do our copy work. 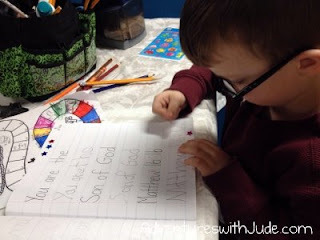 We start by reading the verse (I read, he echoes), then Jude practices identifying letters by telling me each letter on the page before copying. Generally, Jude knows most of them, but often needs help naming/sounding out some a particular few. The letters u and n are typically sticking points for him. First, he read, "Big Y, o, u" and I was quietly thrilled. It was the first time he recognized the letter u. He continued through the rest of the line with no mistakes. Hooray! Then he read started the second line, and read aloud, "big S, o...n, o, f.."and kept going. With each letter, I tried to remain calm, especially since I know d sometimes is a hard one for him. When he got to the end, including "sixteen, two dots, sixteen!" I let out the breath I was holding, grabbed him in the squishiest of hugs, and exclaimed, "You did it!! You got all of the letters right without help!" It was the first time he ever "spelled" an ENTIRE VERSE correctly. Usually he gets a sticker at the end of the copying, but I pulled them out right then and put a blue star (his favorite color) at the top of the page before he had even picked up his pencil! Of course, the next verse that we did, he got stuck on U again. I'm still excited and proud. At least once, he knew the letters. I'm sure we'll get to complete mastery eventually, but for now, once is enough to keep us going. Plus, I think that's a totally fantastic verse to achieve a perfect score on, don't you? I'm linking up with Marcy at Ben & Me - the letter of the week is Y. Y-not stop by and see what others are talking about?